Garrison chief of staff Lt. Col. Greg Scrivens, far left, and USAG Bavaria Command Sgt. Maj. Michael Sutterfield, far right, pose with this year’s volunteers of the year. From left: Anni Zeitler (local national category), Jim Federline (civilian/retiree category), Jennifer Nash (family member category, Spc. Caleb Dickerson (active duty category) and Kendall Thompson (youth category). VILSECK, Germany — There are 447 service members, family members, local nationals, youth, civilians and retirees who — from March 2017 to February 2018 — logged over 43 years’ worth of man-hours. Over 250 on-post organizations currently use their services. And in the past year alone, the total dollar amount for their labor would equate to $2,163,378.52. They are Grafenwoehr and Vilseck’s volunteers, and they are the lifeblood of our community. On Wednesday, April 18, they were recognized for their support and commitment at a ceremony here at the multipurpose center. Organized by the garrison’s volunteer program manager, Porché Leonard and the staff at Army Community Service, the event drew a large crowd of both volunteers and the beneficiaries of their services. Photos of the event are available on the USAG Bavaria Flickr page. “The strength of the Army lies in its Soldiers,” said Lt. Col. Greg Scrivens, garrison chief of staff, in opening remarks. “And the strength of Army communities lies in the talents and contributions of its members,” he said referring to the crowded room of volunteers. 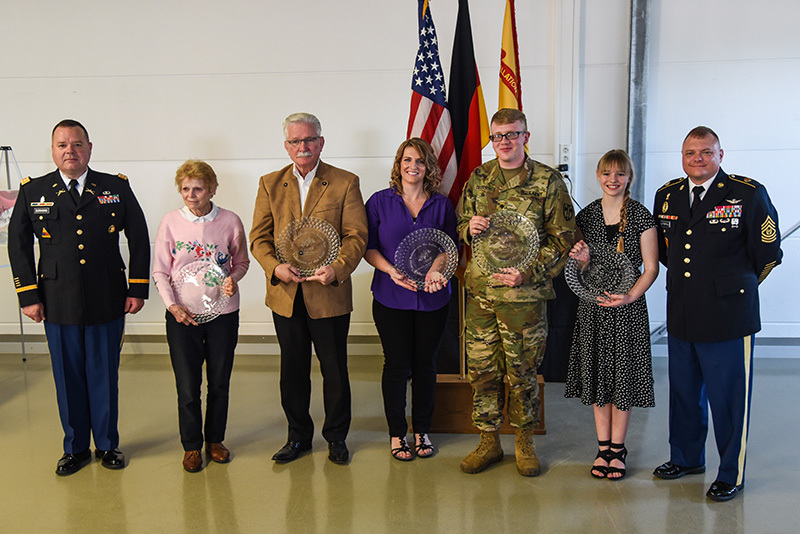 Grafenwoehr and Vilseck’s volunteers come from all different corners of the USAG Bavaria community representing many organizations, Scrivens said. Grafenwoehr and Vilseck’s 447 volunteers recorded 89,618 hours of service totaling 11,202 days of work. Agencies from around the garrison submitted “Volunteer of the Year” packages at the beginning of the year. A selection panel convened in March to select winners in five categories: Active Duty, Civilian/Retiree, Local National, Family Member and Youth.